One of the most frustrating pieces of the Lyme disease puzzle is that testing for the illness is so problematic. Due to faulty tests, a huge number of people who actually have Lyme are told they do not have it. They miss the opportunity for early treatment—when their chances for beating the illness are the best—and the disease is allowed to become deeply entrenched in the body. The latest issue of the Lyme Times includes an excerpt from Mary Beth Pfeiffer’s important book “Lyme: The First Epidemic of Climate Change.” In it, the author delves into the thorny issue of diagnostic testing, and how the CDC’s “two-tier testing” for Lyme disease came to be. 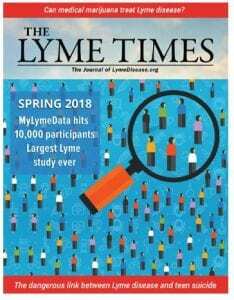 Online access to current and past issues of the Lyme Times is available free to members of LymeDisease.org. If you haven’t yet, join now and start reading this issue today.